Smartwatches are all the rage these days, but you don’t need to break the bank to get cutting edge tech on your wrist. 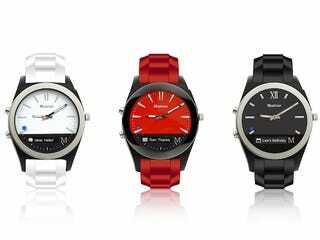 The highly rated Martian Notifier Smartwatch packs all the features you’d expect from a wearable in a stylish timepiece you won’t want to take off. Normally $130, Kotaku readers can get one for just $35.99 + free shipping, over 70% off MSRP. It’s no surprise that Consumer Reports ranked the Martian Notifier as a“Top 4 Best Smartwatch” in 2014 - it’s a solid, stylish timepiece that does everything you’d want a smartwatch to do. From receiving app notifications to remotely snapping pictures using your phone camera, you’ll find this watch a boon to your personal productivity—not to mention a sleek addition to your accessory collection. The Martian Notifier is compatible with nearly any iOS or Android device,which it syncs to via the free Martian App. It’s available in black, red, or white so you can coordinate with any style. For just $35.99 + free shipping - over 70% off MSRP - this is a deal you don’t want to miss. Head to the link below to grab yours today.